The Breyer Carina and Selene 90186 are the final models for 2017 Premier Club members. The Premier Club Stablemate will ship after this set but Carina and Selene are the last of the 2017 Club models to purchase. They are brand new sculpts by Brigitte Eberl and portray historical Lipizzaners which came in a wide array of colors including appaloosa! Their stunning paint job was designed by artist Kimberly Bleecker of Total Equine Image. Carina and Selene cost $141.66 ($175 including the deposit paid to join the Premier Club) plus $17.50 for domestic shipping and handling. After the rather disappointing quality on Duende, I’m very hopeful that Breyer stepped up the quality control on this lovely mare and foal pair! Please keep in mind that these photos are of the prototype resins that were handpainted by Kimberly Bleecker. These are not photos of the horses in plastic with a Breyer factory paint job. 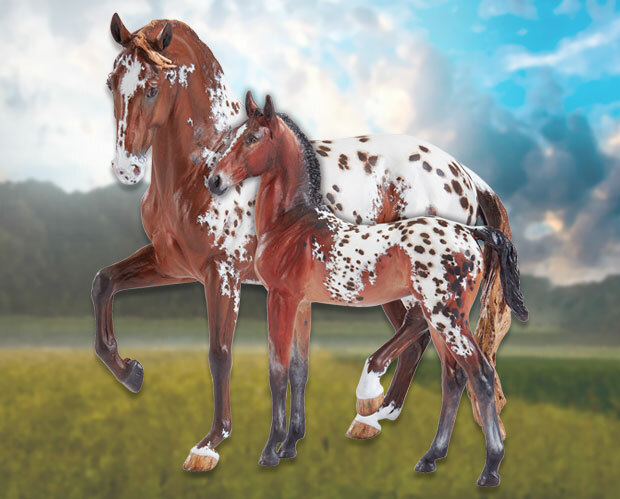 If you are a member of the Breyer 2017 Premier Club, make sure you are logged into your account and you can purchase Carnia and Selene at this link. Introducing Carina & Selene! The Third Release in the 2017 Premier Club. Carina & Selene’s coats were inspired by the variety of colors Lipizzaners displayed early in the breed’s history. Appaloosa, piebald, shades of bay, and palominos are seen in historical works of art depicting Lipizzaners, such as the paintings of 18th century artist Johann Georg de Hamilton. Carina has a flaxen liver chestnut semi-leopard appaloosa coat, and her filly, Selene, has a bay blanket appaloosa coat. Both feature rich shading and detailed eyes. Their sculptures embody the power, awareness, and carriage inherent to the Lipizzaner breed. Each model is painted by hand, making each a unique work of art to be cherished for generations. This Premier Collection exclusive release was sculpted by Brigitte Eberl and represents a proud, dynamic mare and her noble filly. 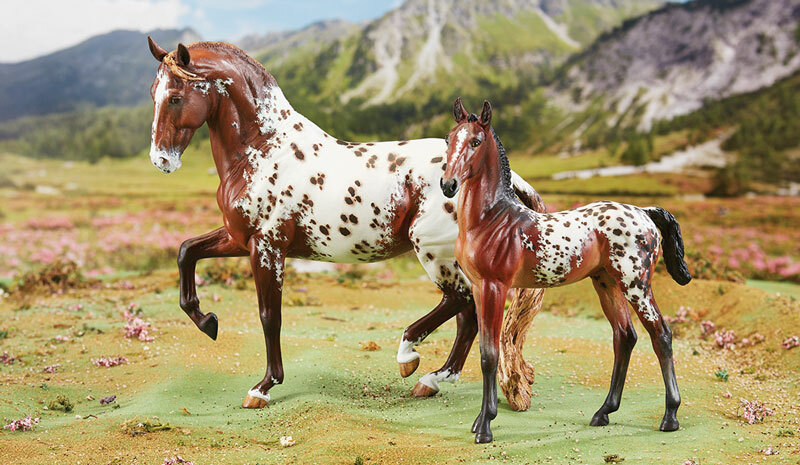 This mare and foal set has all the expression and detail you’ve come to love from Brigitte, who also sculpted Breyer’s Valegro, Totilas, GG Valentine & Heartbreaker, and more! Their loud spotted coats were designed by talented artist Kimberly Bleecker and represent those colorful early Lipizzaners! « Breyer Rosalind and Rigel Unicorns!